Simple and comfortable but still in the usual quality and with small details.One extra Pocket on the side , small extra pocket on the front, woven label at the right hem, large fauxleather label at the back and 2 rear-pockets. So that everything is packed well, we gave these shorts a stable metal knob . 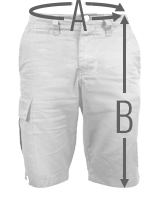 The pants are a bit smaller than regular size, so it is better to order one size larger. Diese Shorts bestehen aus 100% Baumwolle und verfügt über einen stabilen Metallverschlussknopf + Reisverschluss. Als kleines Extra hat diese Hose eine Paspeltasche vorne rechts, sowieso 2 Gesäßtaschen.